Along the Allegheny River just northeast of Downtown is the mile-long stretch known as the Strip District, one of Pittsburgh's most popular spots for great food and nightlife. Along The Strip, industrial and warehouse spaces have been reclaimed to support a bustling marketplace and provide the perfect architectural setting for some of the city's trendiest nightclubs and restaurants. 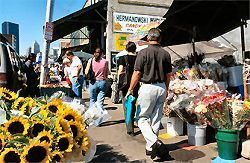 During the day, the Strip District is a bustling market district where you can find fresh fish, meat, poultry, produce, ethnic foods, and knick-knacks of all kinds at very affordable prices. Wholey's Seafood is a must stop for the largest selection of fresh seafood and produce. Other Strip favorites include Mike Feinberg Company, Sunseri's Italian grocery and Benkovitz Seafoods. If you're heading to the Strip for a morning of shopping, be sure to stop in at DeLuca's for a good, hearty breakfast or one of the Strip's good coffee shops. Lunch and dinner offer a number of options, including Pittsburgh favorite Primanti's where the overstuffed sandwiches feature the cole slaw and French fries packed inside with the meat and cheese. Or try Kaya for Caribbean cuisine, Lidia's for Italian or Mullaney's Harp & Fiddle for traditional Irish pub food. The Klavon's Ice Cream Parlor is another popular spot, with its original fixtures, stools and marble soda fountain counter. One of Pittsburgh's top nightlife destinations, the Strip Distict has quite a few nightclubs and bars, including several following the trendy ultra lounge concept. Prive Ultra Lounge, Pure and Altar Bar all offer VIP bottle service, several dance floors and private seating areas for conversation. The 31st Street Pub (although a bit of a dive) is a great place for rock 'n' roll. Located at the entrance to The Strip, the Senator John Heinz Pittsburgh Regional History Center profiles the people and events that shaped the region, from times of hardship to times of prosperity. There is no better place to grasp a sense of Pittsburgh's continued renaissance. 16th Avenue in the Strip marks the start of the 16:62 Design Zone, which continues along Butler Street and Penn Avenue into the neighborhood of Lawrenceville. This distinctive 56-block area is the place to shop for one-of-a-kind home furnishings, antiques and objects d'art. The old brick buildings of the former warehouse district have become a hot commodity for people looking for unique loft living near downtown Pittsburgh. The Brake House lofts, located in the building where the movie "Flashdance" was filmed offers amazing views of the city skyline. The old Armstrong Cork Factory is now home to hundreds of hip, luxury loft units and even features its own private marina. The Strip District, just east of Pittsburgh's downtown triangle, runs between 11th and 33rd streets along the southern shore of the Allegheny River. The historic market district runs from 16th to 22nd streets. There's plenty of parking if you choose to drive, or you can get to the Strip via Port Authority bus service. The Strip District is represented by Pittsburgh City Council District 6.